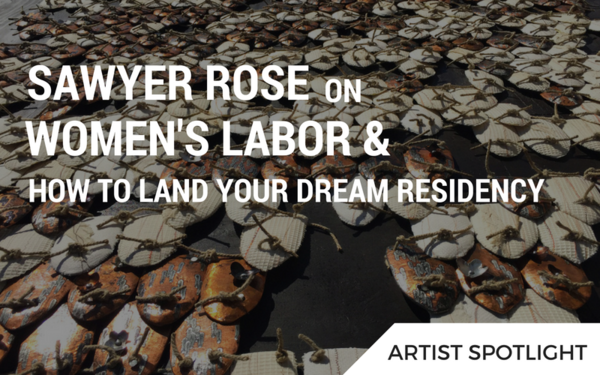 A few years back, artist and sculptor Sawyer Rose started noticing a trend appearing among her female friends: on top of their professional responsibilities, the majority of the women she spoke with assumed the bulk of household chores. And, it wasn’t just her circle of peers that confirmed this assumption. In recent data from the OECD you can see that women all around the world do a disproportionate amount of unpaid work. While the margin is smaller in wealthier countries like the U.S., women in the United States still shoulder over 4 hours of unpaid work a day, compared to 2.5 hours of household work reported from men. What’s more, the OECD estimates that by decreasing the global average of unpaid work that lands on women from 5 hours a day to 3.5 hours a day, their participation in the labor force increases by 20%. With the numbers behind her, Sawyer took to the studio to communicate this finding in the way that she does best: through data, materials, and social participation. We spoke with Sawyer about her project, “Ties That Bind,” in which she documents the lives of 47 women who used a custom-built app to track the hours they spent on paid work, unpaid work, and other activities. 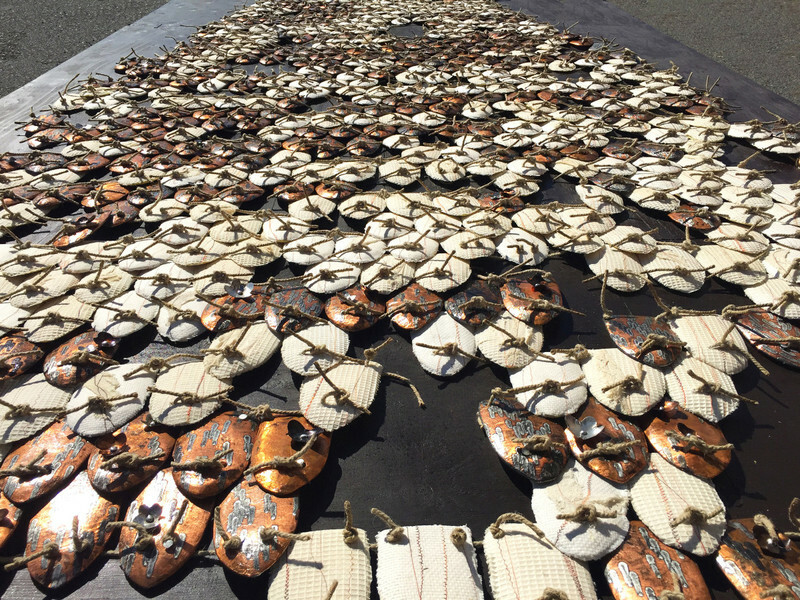 Using 1000 handmade tiles each representing a number of hours, Sawyer invites participants to come and interact with the data in a very physical way—through the collective building and tying together of a sculpture. Want to see more of Sawyer Rose’s projects and sculpture work? Check out her Artwork Archive Public Profile Page. AA: When did you get the idea to start Carrying Stones? Was there one incident that inspired you? SR: The Carrying Stones Project began to take shape in my head slowly, over a few years when my children were still very young. Caring for two little ones while maintaining a full-time studio practice was (and still is) exhausting, both mentally and physically. And, as I talked to my female friends, I heard the same from them, over and over: “I’m tired. Why does the cooking and cleaning and kid stuff always default to me?” Even the women who worked outside of the home felt this way, which seemed deeply unfair to me. So, sensing a pattern, I swung into research mode. I learned that women in every country in the work do more unpaid domestic labor than men. Every. Country. I found out that in the US, women’s home labor adds up to as much as 26% of the GDP. Now I was p*ssed. I mean, it comes as no surprise that gender inequality is rampant and institutionalized, but now I had numbers to back up my feelings. And that, I thought, is what we need … more numbers. Exactly how hard are women working? Time to stand up and be counted. The first sculpture from The Carrying Stones Project, titled, “Ties That Bind,” documents the lives of 47 women who tracked the hours they spend on paid work, unpaid work, and other activities in a custom web app I designed. “The Ties That Bind” sculpture is a data visualization of those hours, made of 1000 handmade tiles—each representing an hour of time worked. 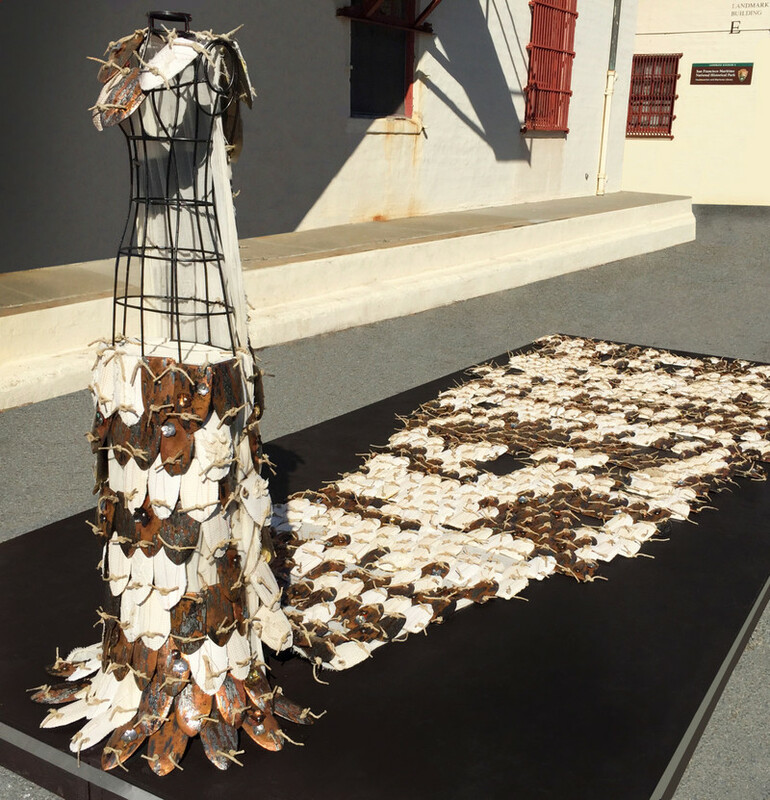 Building the piece felt like giving voice and space to working women who otherwise would be laboring in the background. AA: Can you describe a little further the full scope of the project in terms of the social practice and video components? What does the timeline and extent of the project look like to you? SR: People can understand data better if they can interact with it. For “Ties That Bind”, everyone who came to the opening got to participate in the actual building of the sculpture. There were tiles representing paid labor and unpaid labor, and as people tied them together, they were able to directly appreciate the sheer number of labor hours women are working. Some folks even brought their kids and tied while talking with them. That was, undoubtedly, the best part of the experience. A documentary video about Carrying Stones is planned for 2017. It will detail the construction process of the “Ties That Bind” sculpture and chronicle the assembly performance. It will also feature interviews with project participants to show the human faces behind the data, and the prevalence of gendered work inequality. AA: What have you learned from the project that you weren’t expecting when coming into it? AA: In your discussion with women participating in this project have any stories, in particular, stood out to you? SR: There was this one moment when real life intersected with my work perfectly. A friend of mine who was supposed to attend the assembly performance at the opening of “Ties That Bind” called to tell me she couldn’t make it after all. Her father was moving to a retirement home that day and she needed to be there to care for him. I said, “So you’re missing my project about women’s work because you have to do women’s work?” So apropos. AA: What are you hoping that people will take away from your project? SR: I would love for men and women both to understand that when the cooking, cleaning, and caring responsibilities default to women, it keeps them from advancing at work and in society—and that more balanced gender workloads benefit everyone economically as well as socially. So grab a broom, guys, it actually makes the world a better place. So, how does Sawyer Rose manage to balance it all while maintaining a full-time studio career? AA: Do you have a studio routine when you get into the studio? AA: You have been awarded numerous residencies and worked all over the world as a result … how has this shaped your practice? First, the people: if you attend a residency program with a group of artists, I can pretty much guarantee that you will have your mind blown by the amazing intellects surrounding you. Cross-pollination of ideas is one of the most valuable, and enjoyable parts of the experience. And on the practical side, the networking opportunities are innumerable. The “clean slate” feeling I get when I’m working away from my home and studio has been useful, too. It’s freeing to have a fresh, new space away from my same four walls and that mess in the corner that I meant to clean up yesterday. It’s a great time to start a new project. AA: What advice would you give to other artists seeking out similar opportunities? SR: Think about how long you’d like to be away, whether you’d like to travel far or stay local-ish, whether you might prefer a small or large residency program…then go to www.artistcommunities.org or www.resartis.org and check out the listings. There are hundreds, so play with the filters and you’re sure to find a few that are a good match. Then, apply! Make a good impression by putting your best images first and choose images that form a coherent portfolio. AA: How would you recommend other artists present themselves professionally? SR: One thing I hear again and again from arts professionals is that artists are often painfully disorganized, bless their hearts. An easy way to battle that “disorganized artist” stereotype? Sign up for Artwork Archive like Sawyer Rose and start presenting yourself in a professional manner. Don’t wait for disaster to strike your studio before engaging a lawyer! Attorney Kathleen Alt explains when and why lawyers are essential to artists - and affordable.